That celebratory time of the year had come again, when exhilaration and enthusiasm were at their peak amongst everyone in the campus at SIMSREE. Reminiscence – the mega annual reunion of all the batches that graduated over the years from this esteemed institute was here. One of the most important traditions of the institute, Reminiscence provides a platform for visiting alumni to relive their best moments at SIMSREE. This year, Reminiscence was held on 12th September. The event started at six in the evening and went on till quarter to midnight. Although heavy rains greeted the evening, it did not deter the alumni from visiting their alma mater. Many esteemed alumni graced the evening with their presence. 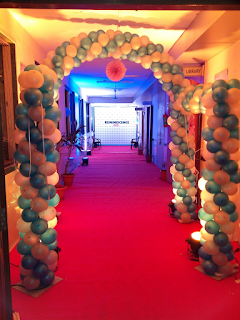 The red carpet at Reminiscence, came to life for the first time with continuous tweets on Twitter, the hashtag being #Reminiscence2015. The event began with an inauguration by the new director of the college, Dr. M. B. Bhide, Dr. M. A. Khan, Registrar, Mumbai University and former director of the institute and the Sydenham Institute of Management Alumni Association (SIMAA) board members present, Mr. Mahesh Balasubramanian, Mrs. Sneha Pathak and Mr. Aashish Pawaskar, followed by a short speech by Dr. M. D. Bhide, and Mr. M. A. Khan. The batch of 2015 was welcomed into the SIMSREE alumni family. The evening moved onto more celebrations including a variety of activities such as photo booth and karaoke. The alumni had a crazy good time posing for the cameras with props and receiving instant prints at the photo booth. The karaoke room was filled with the delightful voices of alumni singing karaoke of old time songs. Not to forget, the one minute games which were such a hit amongst the alumni. Many of the alumni got nostalgic revisiting the college after several years and appreciated the changes as well as the things that have remained the same. The innovative events and arrangements at the event were the talking point among many groups of alumni. Conversations flowed, old memories were reminisced and new ones were made. The recent graduates were excited to visit the college as alumni and the older ones were glad to see how their college had improved over the years. It goes without saying that delightful dinner, pleasant music and entertaining snaps completed the wonderful event. It was indeed an evening to remember. We thank all the alumni that made it to the event and look forward to seeing many more at Reminiscence 2016. It is necessary for corporate event planners to pay the required attention to the aim of any particular corporate events. Launching a new consumer product is a good example of how to handle a special type of the corporate event. Launching an item includes the customer indictment as the greatest goal.